Maureen Drdak travels widely in pursuit of her visions; her research has taken her to Europe, North Africa, the Middle East, India, Nepal and the Himalayas; Drdak’s work references universal paradigms of mythic archetypes--both ancient and contemporary forces converge in her work. A graduate of the Pennsylvania Academy of Fine Arts and the University of the Arts in Philadelphia-- she is the recipient of numerous honors, including the 2011-2012 U.S. Fulbright Senior Scholar Award for Nepal; her Fulbright work, The Prakriti Project, pioneered the first synthesis of repoussé metalwork and contemporary painting; many of the works presented on this site feature this groundbreaking synthesis. Drdak received personal support from H. F. Lenfest and Eugene V. Thaw for Lung-Ta, an interdisciplinary collaborative with international composer Dr. Andrea Clearfield inspired by the Tibetan Kingdom of Lo in the Nepalese Himalayas; Lung-Ta premiered at the University of the Arts in Philadelphia in 2009 and had its Midwest premiere at the University of Chicago’s Rockefeller Chapel in May, 2012. Her work is found in numerous public, private, and university collections within the US and abroad, among them art collectors Berthe and John Ford, Shelley and Donald Rubin (The Rubin Museum of Art), Lynda and Stuart Resnick, Emir and Sheikha Mozah of Qatar, the Philip and Muriel Berman Museum of Art, and Yad Va Shem Holocaust Memorial in Jerusalem. Her exhibition history includes numerous solo and group exhibitions in the U.S. and abroad, international arts festivals, and museum and academic lecture venues by invitation. She had several published works to her credit, most recently for the international arts and cultural magazine MARG, and the peer-review journal, HIMALAYA. Drdak is currently the President of the Fellowship of the Pennsylvania Academy of the Fine Arts. Drdak’s current CV can be accessed here. My work is an exploration of philosophical and cultural synthesis in which eastern and western iconographies and cultural paradigms are meaningfully integrated, bringing together disparate materials, traditional and contemporary aesthetics, and symbolic language. I enlist and explore imagery that bridges diverse cultural paradigms in the service of transcultural communication. Over the last decade my work has been deeply inspired by my travels in Asia—especially the Himalayas where I conducted my recent 2011-2012 Fulbright research—and the deserts of the American West; these landscapes are powerful metaphors for the universality of physical and cultural forces in opposition and integration, and my selection and application of materials are reflective of these energies in eternal congress. Growing threats to these sublime geographies and their cultures are the ominous forces of global warming, compounded by demographic expansion and dislocation. Believing that the powerful and expressive potential of indigenous ways of seeing and knowing can be effectively harnessed to contemporary art practice, my work endeavors to engage the viewer on a visceral level--thereby visually accelerating meaningful apprehension of these growing forces of degradation and dislocation, and increasing awareness of the interrelationship of environmental and cultural preservation. My Fulbright Research Fellowship—The Prakriti Project— pioneered and established the first synthesis of repoussé metalwork and contemporary painting. In developing this synthesis I studied in Nepal with the greatest family of repoussé masters in existence today, a family whose celebrated lineage dates from the late sixteenth century. The resulting works using my synthesis are the only works of their kind today and I continue to explore its expressive potential; many of these works are presented here on this site and a new body of work is currently in development. Maureen Drdak with her mare Dolma in Choser near the Tibetan border, Upper Mustang, Nepal, 2008. Drdak on Dolma ascending the path to Chele village near the Kali Gandaki's Mustang Gate, Upper Mustang 2008. Drdak at the Nya La pass, Upper Mustang, 4010 meters, 2006. Composer Dr. Andrea Clearfield and Maureen Drdak in newly discovered cave in Chosar, Nepal, 2008. 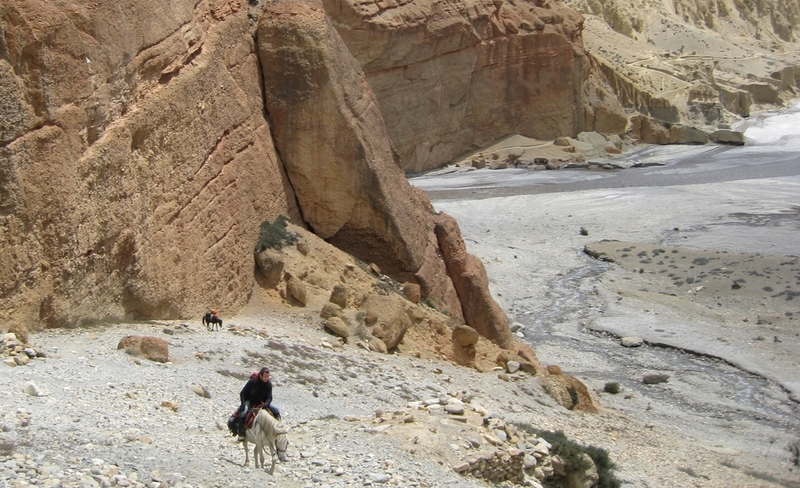 Dr. Sienna Craig, Aida and Drdak approaching the village of Ghemi in Upper Mustang, 2008. Drdak with conservator Luigi Fieni and assistants at Chambha monastery, Lo Monthang, 2008. Drdak, Craig, and Clearfield with Raja (king) Jigme Palbar Bista in Lo Monthang, 2008. Drdak working on repoussé elements of "The Flying Nagas" in the atelier of Rabindra Shakya, Patan, 2012. Drdak preparing repoussé for gilding at Shakya's atelier in 2012. Rudra Raj Shakya, son of Kuber Singh and father of Rabindra with Drdak, 2011. Drdak at the KCAC Patan Museum studio during her Fulbright in 2011-2012. Drdak explaining her Fulbright work to Jonathan Henick, Dep. Assist. Sec./Dir. Public Diplomacy, South and Central Asia, Patan Museum, 2011. Drdak with Fulbright Fellow Ashmina Ranjit and writer Archana Thapa, Patan Museum, 2011. U.S. Deputy of Mission Patricia Mahoney, SAG Dir. Sangeeta Thapa and USEF Dir. Dr. Laurie Vasily, opens Drdak's Fulbright exhibition with Rabindra Shakya at Siddhartha Art Gallery, Kathmandu, 2012. Drdak with her guru, Master Rabindra Shakya with "The Flying Nagas," Siddhartha Art Gallery, 2012. Drdak explains new project to the artisans of Rabindra Shakya's Image Atelier, Patan, 2015. Drdak with Rudra Raj, his sons Rajkumar, Drdak's guru Rabindra and Rajendra, grandson Swarup and artisans of the Shakya's atelier in 2012.